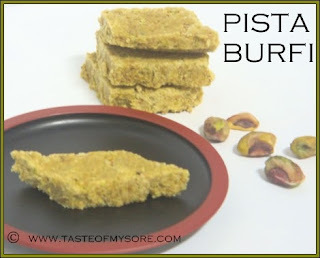 A simple and delicious pista burfi to celebrate deepavali with your loved ones..
Blanch and peel out the skin of pista. You can put them in warm water to blanch. Wipe them with clean towel. Fry/Roast these blanched pista till crisp. You can use Microwave, stove top method to fry/roast them. Let them cool down. Powder these crispy pista to get chunky powder. 3. In a heavy bottomeed pan, take 3/4th cup sugar and very little water and bring it to boil. 4. Boil sugar syrup till you get 1 string consistency. A frim string is formed when a drop of syrup is pulled between two fingers. 6. 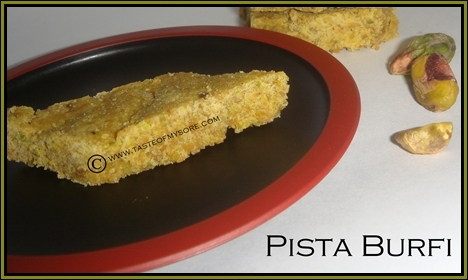 Reduce the flame and start adding pista powder slowly, while folding it with sugar solution. 7. When the mixture starts leaving the base and comes together like a ball, transfer it to a greased plate. 8. Roll it with greased rolling pin. Cut into desired shapes when it is hot. You can decorate it with saffron strands and pista. 9. 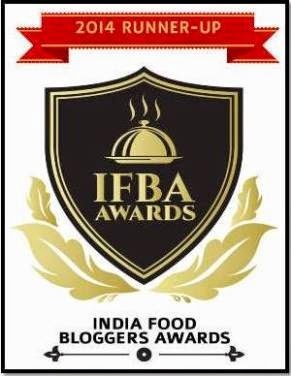 Our burfi was so tempting that we did not think of decking it up before we happily submerged it in! pista burfi super ide ri. ondu thindre hotte tumbida haage agutte alwa? Habbada thayari joridya? Sounds Yummy kanri, happy Diwali...Btw, I would like to invite you to hop in and join us at the Diwali Dhamaka carnival hosted by us. Never made with pista, u did perfectly. Happy Diwali! Awesome and fabulous looking burfi.. Enjoy the brightness and may the happiness last! Wishing u and ur family the best! Just the thing for the festive season ! Thanks for the recipe.